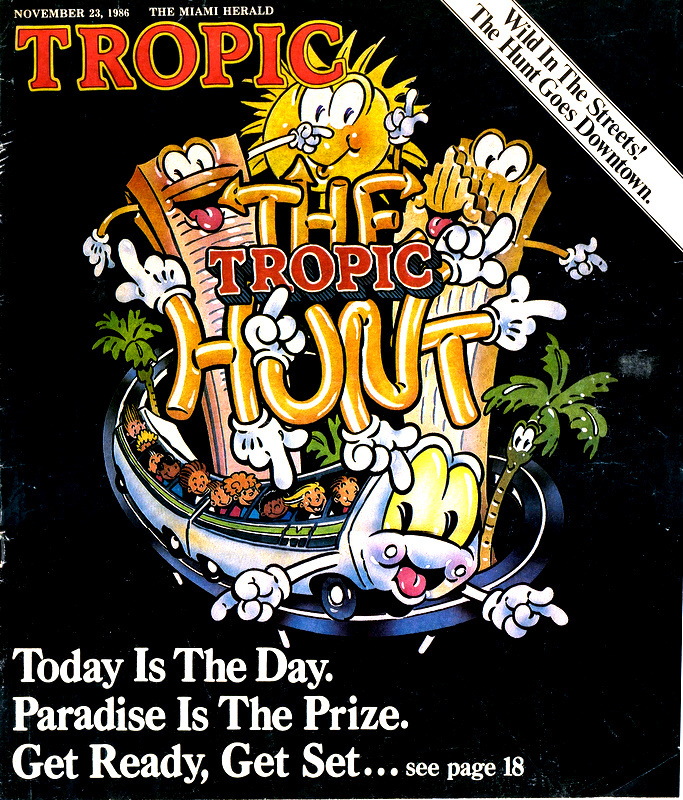 Your online guide to the zaniness of the 1986 Tropic Hunt! 1986 brought us the first style of Hunt that was going to last for the rest of the Hunts: the \'localized\' version of the Hunt, wherein the entire Hunt was contained inside of an area about 4-8 square miles. The reason? Well, everyone was racing (read: SPEEDING) between the Hunt puzzle sites the first couple of years, and that was dangerous. Despite the fact that there was plenty of time to drive between all the sites, people still sped because�well�if you could have more time to make sense of the clues, you had a better chance of winning, right? Also, especially the second year, once the Hunt phenomenon was catching on, the traffic to get to sites was overwhelming�to the point that answers to puzzles were announced on the radio so that people would stop going to them. The Hunt became a victim of its own success! \nSo�in 1986, the Hunt moved to Downtown Miami. And what a great place for a Hunt (it would be the location of two more Hunts in the future!). People got a chance to actually run around and explore a portion of South Florida that they normally wouldn\'t think twice about ever stopping in or driving through. Besides the Hunt, they were able to see what special surroundings, sounds and tastes only Downtown Miami can offer. \nI remember riding Metromover during the Hunt and going over the Three Blind Mice puzzle, which was located in one of the large parking lots across from the Knight Center. The performance at the Gusman theater (one of Miami\'s jewels, by the way! )�and the fortune cookies! 1. Norman is standing exactly on the North Pole. He walks eight steps directly south, then seven steps directly east, then four steps directly north. Then he falls over, dead as a frozen fruit bar. How many steps did Norman take? 2. While driving on Interstate 95, Emily signals her intention to change lanes by putting on her turn signal. This breach of I-95 driving etiquette so enrages the uninsured motorist behind her that he is forced to ram her from behind, causing her car to spin out of control and come to a halt on the shoulder, where she is struck by 20 additional uninsured motorists who are passing the regular traffic on the right at 140 miles per hour. How many uninsured motorists, total, has Emily inconvenienced by her thoughtless actions? 3. Locate the advertisement in this magazine for Leech Jungle. Divide the route number in the advertisement by the admission price for nuns. 4. If a cube is nine inches on each side, and it is made of solid brass, and each cubic inch of solid brass weighs 2.657 ounces, and this cube is dropped from a height of 1,000 feet directly onto Barry Manilow's piano while he is performing I Write The Songs, wouldn't that be great? The answer to this one is 29. 5. Billy goes to Mr. Smith's Candy Store, selects a bag of caramels and asks how much he owes. "Well Billy," says Mr. Smith, "if you pay me one penny, two nickels, three dimes and four quarters, your change will be three-eighths the amount you gave me." So Billy wastes Mr. Smith with a semiautomatic weapon. What is the total number of coins Mr. Smith listed? 6. Farmer Brown lives near a nuclear generating station, and, although he has been assured that there is no danger of radiation leakage, he is afraid that some of his livestock may have been affected. Examine the photograph on Page 27. Can you find any unusual barnyard animals? How many? Anchored offshore Hunters saw three very different boats. Each boat had a sailor standing on deck waving semaphore flags. Hunters were provided a handout of "Vital Boat Stats!" for the boats, which included each vessel's length in feet, width in feet, number of sleeping berths, top speed in knots, and price in dollars. A semaphore guide was also provided in Tropic, along with several other code methods, including Morse code, sign language, and the Greek alphabet. Decoding the signals was simple, but noticing the very minor difference was the challenge. The left boat signaled "NOT ME", the center boat also signaled "NOT ME," but the right boat signaled "KNOT ME," telling Hunters to use that boat's speed, in knots, as their answer. Blind mice in tuxedos roamed everywhere, milling in and out of the crowd, joking, fighting, and just creating a general disturbance. A sign nearby asked "How many mice too many?" Counting the moving mice was the tricky part of this puzzle. They wouldn't stand still long enough to allow Hunters to get a good count. The total number of mice roaming around was 10, which is exactly seven too many. Hunters arrived in the darkened Gusman Theater and watched Avner Eisenberg, (who was also the title character in the movie "Jewel of the Nile") perform a comedy/magic/juggling act. A sign on the side of the stage identified his act as "Avner the Eccentric in Check Your ...". As the grand finale of his act, Avner turned his back to the audience and dropped his pants. On the back of his shorts was the Tropic Hunt logo. When the house lights came up, Hunters were able to see that the number 74 had been silkscreened onto each seat. And the next move's up to you. And tricky is our last. If you don't believe that, good for you. You'll get the answer fast. Is the answer at this site." "Tropic" is the first name, but "Magazine" is the last. Using only the letters M, G, and E, Hunters could create the word MAGAZINE using tiles in other words already placed on the board, with the M and the Z (3 points and 10 points, respectively) falling on Triple Letter Score spaces. Giant speakers at the top of the courthouse steps blared music of all sorts. Making out the individual musical tunes was difficult over the din of all of the other music. Most Hunters found that the best way to determine what each speaker was playing was to stand as close to each individual speaker as possible. Doing this revealed that the left-most speaker was playing "Three Blind Mice," the next "Tea for Two." The third speaker played Beethoven's Fifth Symphony, and the fourth played "76 Trombones." Between speakers two and three was a sign showing several clock faces, each with a unique time. Between speakers three and four was a sign showing two mynah birds. The key lay in realizing that the signs were arithmatic symbols. The clocks represented multiplication (times) and the birds represented subtraction (mynahs, or minus.) 32 times 5, minus 76 equals 84. A giant, colorful rebus, over 300 feet in length, occupied each side of an octagonaly shaped building. Playing in the background, one note at a time, was an annoying, repetitive musical tone. The rebus puzzle translated to english read: "Trap pick well combs you 2 D Hunt for Pear a dice D mu six d key A tell A graph key." Phonetically, it sounded this way: "Tropic welcomes you to the hunt for paradise. The music's the key -- a telegraph key." Located within Tropic were a number of coding systems, including smoke signals (all of which were identical), the Greek alphabet, semphore code, and Morse code. Using the Morse code key, Hunters were able to decode the "music" into the message "twenty-five," the puzzle's answer. Tropic included several coupons for free items. There were a fortune cookie, a kewpie doll, a sexual aid, and a pair of dice, each "available only if available." The only one of the items that was actually available was the fortune cookie, carried around downtown in rickshaws by street vendors who were always on the move. The fortune cookies each contained different fortunes, tasted like normal fortune cookies, and at first glance seemed to have nothing to do with any puzzle. Tropic Hunt instructions warned Hunters to throw nothing away. This was an important clue. Across the cellophane packaging that contained the fortune cookies was the repeated label "Fortune Cookie Fortune Cookie Fortune Cookie." One of these, however, read "Fourteen Cookie." Fourteen was the answer to the puzzle. 7. You await his answer, but instead you are given a conch. 14. You knock three times, and this woman who has unusual teeth tells you she wants the seven magic words. 29. You study its surface, but all you see is the cryptic inscription: "Goobers seven, Spigots fourteen, Righteous Watermelons forty." Now, the whole picture becomes clear. 46. But still, she leads you towards a large man, and, while holding your groin, you ask him, "What's the score, big boy?" 74. First you see a red structure, above which you see the words "YOU ARE NOT WELCOME," which you ignore. 84. You say, "Can a certified actuary dance the mambo?" and she replies, "Nonsense." The correct puzzle answers yielded these clues: 7 - You await his answer, but instead you are given a conch. 14 - You knock three times, and this woman who has unusual teeth tells you she wants the seven magic words. 25 - (Certain things have meaning, even words.) 29 - You study its surface, but all you see is the cryptic inscription: "Goobers seven, Spigots fourteen, Righteous Watermelons forty." Now, the whole picture becomes clear. 46 - But still, she leads you towards a large man, and, while holding your groin, you ask him, "What's the score, big boy?" 74 - First you see a red structure, above which you see the words "YOU ARE NOT WELCOME," which you ignore. 84 - You say, "Can a certified actuary dance the mambo?" and she replies, "Nonsense." Nonsensical though they are, smart Hunters saw that all but one of the clues could be cobbled together to form a story, of sorts, that read this way: First you see a red structure, above which you see the words "YOU ARE NOT WELCOME," which you ignore. You knock three times, and this woman who has unusual teeth tells you she wants the seven magic words. You say, "Can a certified actuary dance the mambo?" and she replies, "Nonsense." But still, she leads you towards a large man, and, while holding your groin, you ask him, "What's the score, big boy?" You await his answer, but instead you are given a conch. You study its surface, but all you see is the cryptic inscription: "Goobers seven, Spigots fourteen, Righteous Watermelons forty." Now the whole picture becomes clear. The remaining clue, in parenthesis, led Hunters to words with an even number of letters. With the clues in this order, the words with an even number of letters spelled out the message "IGNORE THIS NONSENSE. YOUR ANSWER IS FOURTEEN." The final clue, given at 3:15pm was simply "The letter D." Taken together, 14-D seemed to be a set of coordinates on the Hunt map. Placed at that location was a sign reading "We Crossed You Up." The typeface on the sign was crucial, however. It was the same typeface as the title "Crossword" for Tropic's crossword puzzle. In that puzzle, the clue for 14 Down (or 14-D) was Wholesale Measure. Smart Hunters knew that a wholesale measure is a bushel. Really smart Hunters noticed that on the Hunt map there was a farmer carrying a bushel basket under a bridge on SE 2nd Avenue. 21 Hunters reached this final solution, and later participated in a tiebreaker. Photo - The 3rd place team's prize letter! CLICK HERE TO BROWSE PHOTOS FOR 1986!